Here B2 wins, because I used to say I didn’t care for podcasts, even though everyone and their mom has been telling me to listen to them for years. He laughed at me and said, “That’s like saying you don’t like movies. You just need to find one you like.” For some reason, with a few exceptions here and there, I just didn’t think they were my thing! (Not even Serial. Yep. I said it.) But as usual, B2 was right — and as with most every aspect of life, it just needed to involve food. 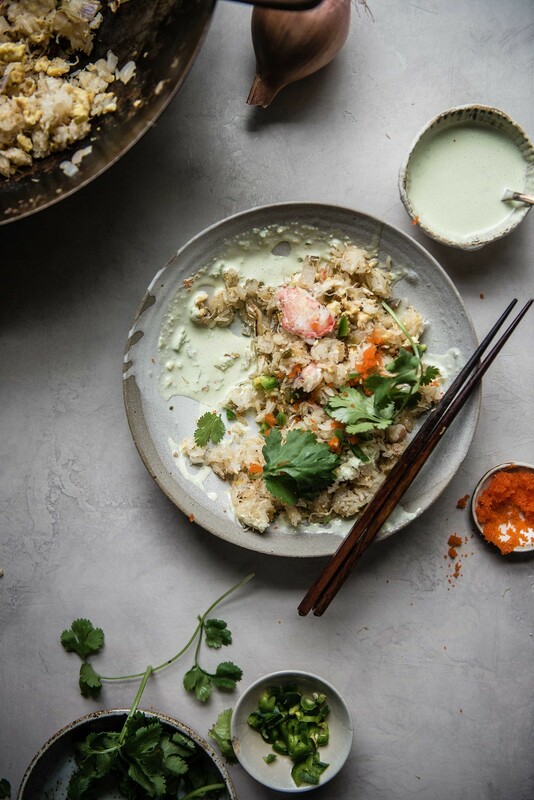 As it turns out, when food podcasts treat my ears to the actual delicious sizzling of someone making the most amazing-sounding (literally) crab fried rice to pass the time while I inch along in traffic, all bets are off. This is just what happened a few weeks ago — Francis Lam and Dale Talde made crab fried rice on The Splendid Table (yes, it appears that even when I don’t listen to NPR I listen to NPR) and it sounded so good that when I got home I zero percent wanted whatever it was that we planned to eat for dinner and one hundred percent wanted this instead. 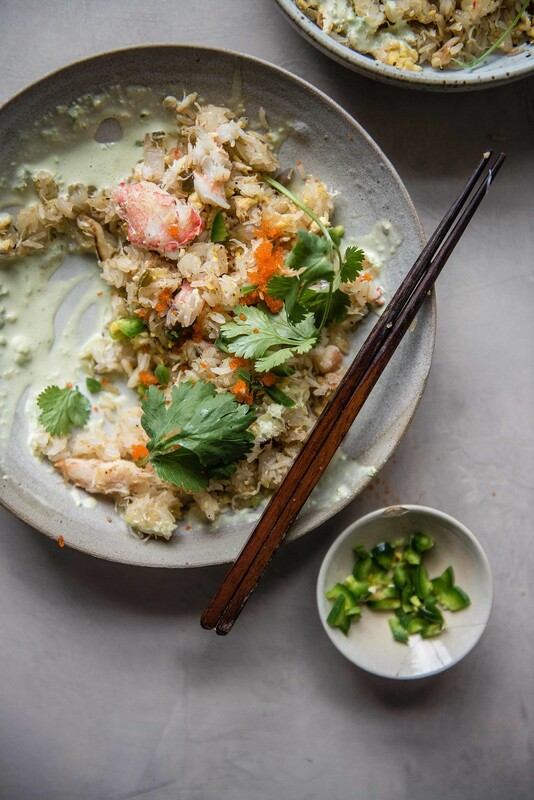 Celery, shallots, and pickled jalapeños are sweated in popping oil over high heat until fragrant, followed by eggs quick-scrambled right into them, fluffy white rice, and tender, feathery crab meat. 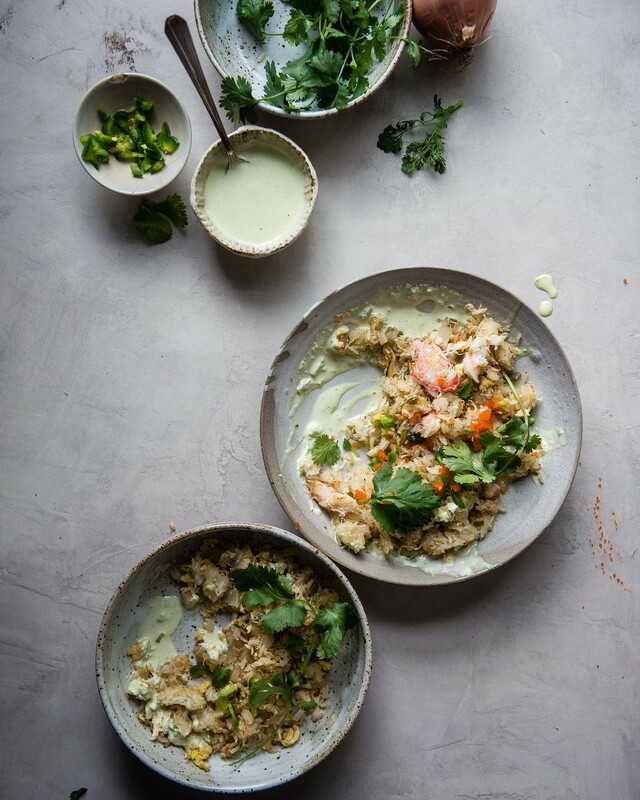 It’s finished with briny tobiko and bright cilantro, and drizzled with a pastel green aioli, whizzed with jalapeño and fish sauce until simultaneously spicy and funky-savory. In my own kitchen, I swapped out the regular rice for sticky long-grain rice, after a totally bewitching crab sticky rice I had years ago at a sky-high restaurant in Tsim Sha Tsui, and an equally delicious fried sticky rice I had much more recently at dim sum in Alhambra. Sticky rice, when fried up, is not so much sticky as it is wonderfully chewy, a lip-smacking texture that leaves all memories of dreaded soggy fried rice in the dust, and it absorbs the savory flavors it’s fried in with such readiness that it makes you wonder if there’s any reason to ever use any other rice. (That it requires a lengthy soak and more than just my rice cooker, though, are two.) 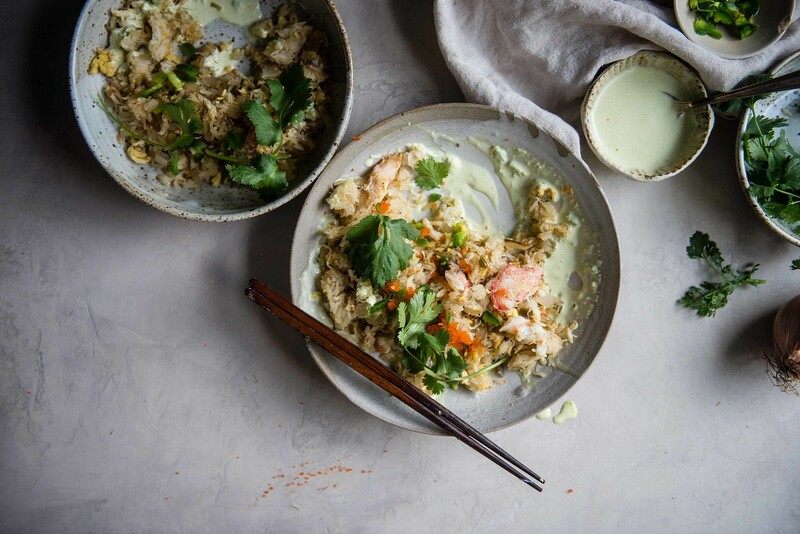 With the smoky wok hei from frying all your aromatics on high heat, a little bit of cooking wine to accentuate it, the pickled jalapeños and the fresh crab meat, this fried rice (which I made with a lazy mayonnaise — mayo-lazy? — aioli) is by turns smoky and deeply savory, creamy and pungent, laced with a brow-sweating heat and completely addictive. It’s the best thing that could possibly come out of a work commute — other than getting home, of course. P.S. Any favorite podcasts you especially like and you think I should listen to? Tell me! Adapted from Dale Talde on The Splendid Table. At least 2 hours and up to 24 hours ahead: Rinse the sticky rice several times in cold water and cover with water in a large bowl. Let soak for at least two hours and up to 24. The day of: Bring a couple of inches of water to boil in a large pot or wok. Drain the rice in a fine-mesh strainer or colander, and place over the boiling water in a bamboo steamer or a colander lined with cheesecloth. (I used a piece of parchment paper, too, just to keep from sticking. No pun intended!) Cover and let steam for 15 minutes. Uncover and flip the rice a few times with a paddle, then cover again and continue to steam for another 10 minutes, or until rice is translucent, glossy, and not at all crunchy. If there are still hard bits, continue to steam for another 5-10 minutes. Heat a wok or large skillet over high heat until very hot. Add the vegetable oil and heat until shimmering, then add the shallots (or onion), celery, garlic, and pickled jalapenos. Season with about ¼ teaspoon or so salt, then cook, stirring, until shallots begin to soften. Push the aromatics to the side and add the beaten egg. Cook, stirring occasionally, until the egg reaches a soft scramble, then add the sticky rice, crab meat, salt, and pepper. Drizzle the rice wine evenly around the edges of the wok, if desired. Stir vigorously until it's all well-combined, then turn the heat down to its lowest setting and cover while you make the aioli. For the aioli: Combine the mayonnaise, jalapeño, and fish sauce in a blend and whizz until smooth. Add a swirl to each plate, then serve the fried rice on top, followed by cilantro and tobiko (if using) and an extra drizzle of aioli. Enjoy! I think we experience a similar issue/delight from listening to food podcasts. The sounds and descriptions of cooking are almost as tantalizing as the far-off aromas must be. “The Sporkful” (fun food minutiae), “Radio Cherry Bombe” (interviews with women in the food industry), and “A Taste of the Past” (food history) are a few of my favourite podcasts. I love the Sporkful and Cherry Bombe! I’m going to check out A Taste of the Past right this minute — thank you so much for these recs! I’m a rare podcast listener, as I don’t commute, but I like the suggestions 🙂 This sounds beyond delicious. No wonder you had to make it. Any chance you’d also recreate the “totally bewitching crab sticky rice” you had years ago? “Bewitching” is powerful temptation. I’m curious if it is similar or different. You know, it’s so funny, Linda! I actually hardly remember what was in that crab sticky rice other than, well, crab and sticky rice. It was very savory but not spicy. If I ever make it back, I’ll have to do some real recon for you. But — and I might be biased — I do think this is equally good 🙂 Thank you for the kind words! I am yet to listen to Podcast , don’t ask me why! May be like you said, I just need to find one that I like. I say it’s a good thing it inspired you cause the dish sounds JUST TOO GOOD! I love seafood and that aioli sounds fascinating! I have to try this idea. It took me forever to get into them! But there are so many out there that it’s just like my husband said, there’s bound to be one that absorbs you 🙂 Thank you, Kankana! I third you both!!! But can’t wait to check out the Feed. Thank you so much, Rossi! Hi, I’ve been listening to Christopher Kimball’s Milk Street Radio, Special Sauce with Ed Levine, Bon Appetit Foodcast, Chewing, and the new House of Carbs. Ooh, I’m a big fan of Milk Street Radio! I might have to listen to House of Carbs if only for the name alone (and a love of carbs). Thanks so much for these great recs, Diana. I love the Cherry Bombe and Serious Eats podcasts. This looks delicious Cynthia! 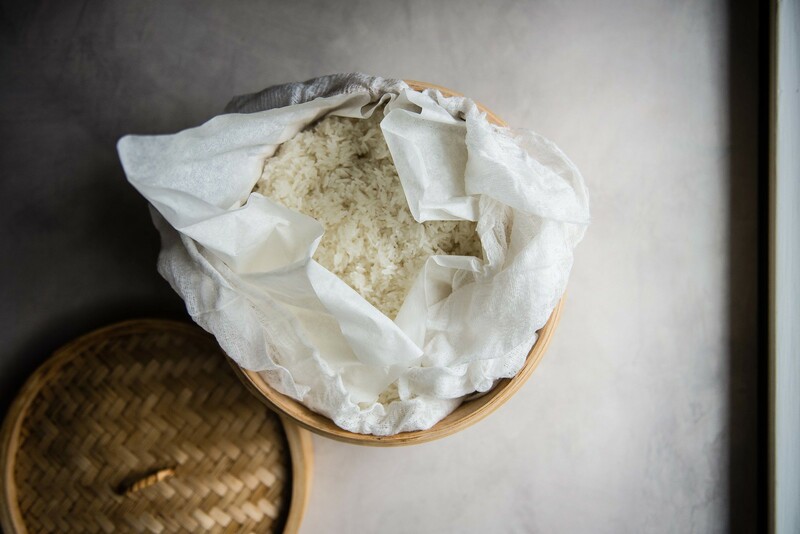 Question: do you have a brand of sticky rice that you recommend? Do you buy it at a particular shop? You’re going to laugh, but I just ordered it off Amazon! This one is the one I bought. I think Thai sticky rice is a great bet — I like it even more than Chinese sticky rice (I’m betraying my heritage!) because it’s long grain and drier in texture. Thank you for the kind words, Alex! I’ve been meaning to check that one out for so long! Thank you, Heather! I am a podcast addict!! And jalapeño aoli sound magical!! I’m allergic to crab but imagine the same thing is achievable with a myriad of other things. I’m thinking SHRIMP! Yum! 🙂 I’m also a fan of the “Spilled Milk” food podcast… but thats probably because I’m from Seattle where its based. I think shrimp would be amazing!! I can’t wait to listen to Spilled Milk. Thanks, Maria! Yessss to this rice and to podcasts! Besides NPR, Gimlet makes great podcasts too. And to feel like I’m learning things I like Revisionist History, for judging people’s crazy startup ideas /auditory-Shark Tank I like The Pitch and to laugh/kind of learn things I like Hound Tall. Hahaha I’m so glad that you found that hilarious because we did too. Thanks for all these recs, Joyce! Jasmine rice will work just fine! 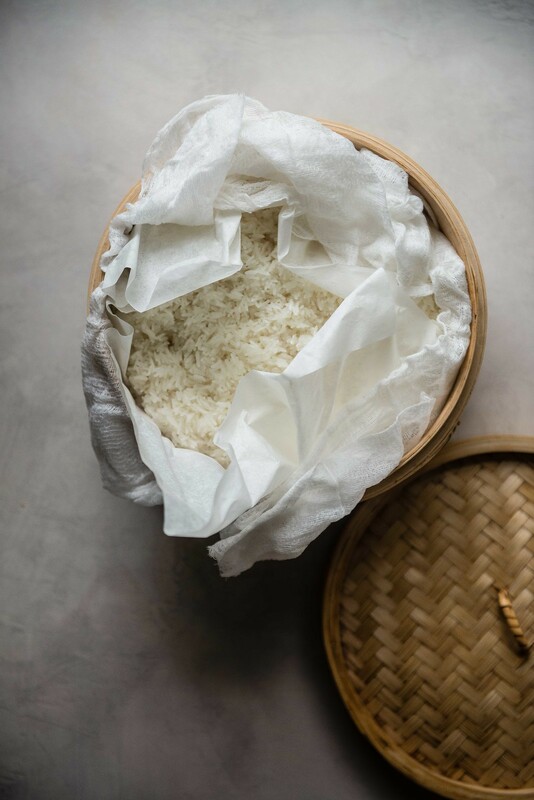 Sticky rice has a fairly different consistency from regular rice — it’s a bit chewier and more resilient, and it is what gives things like mochi their chewy texture. I liked it in fried rice because I found it heartier and sturdy, with a fun, bouncy texture, but for most of my life I made fried rice with long grain or short grain white rice and that will be delicious, too. 🙂 I hope you enjoy it if you try it, Meme! I love this list! Thank you so much, Anna! So pumped for this recipe!! I eat at Talde probably once every other month (you might say I’m obsessed) and get the crab fried rice almost every time! It’s so good. As soon as I saw the title I knew it had to be Dale’s recipe. So excited to try this. Oh my, that’s awesome! I’ve never been to Talde, so if you try the recipe, I’ll be so eager to hear what you think. 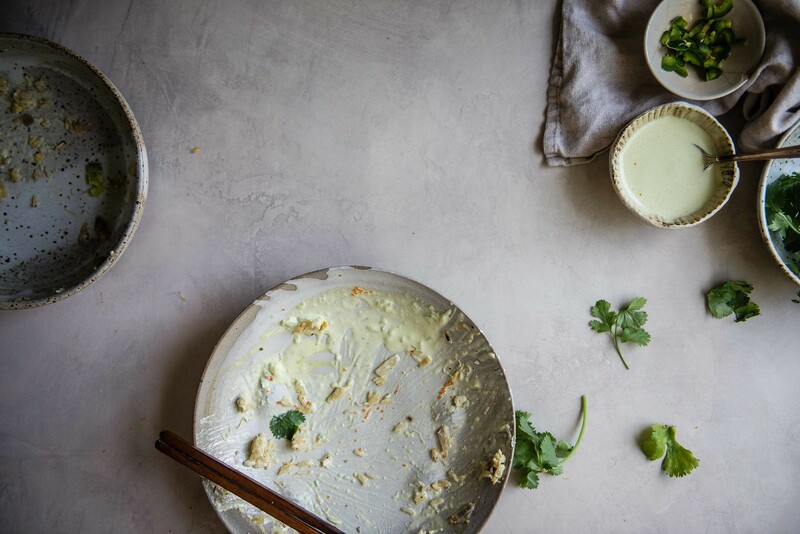 You might want to check out his original recipe up on The Splendid Table too! Thanks so much for stopping by! I live within walking distance, it’s a blessing and a curse. I’ll let you know how it is/compares if I try it! You Made it Weird with Pete Holmes. Zero food, but seems like your kind of podcast. Oh gosh, and now all I want to eat is crab fried sticky rice. I am one that has always enjoyed sticky rice at those restaurants but have never attempted it myself at home. I am tempted to now though. 🙂 It looks SO good. And I’ll have to try that restaurant in TST the next time I’m in Hong Kong! I was the same as you and was surprised at how well it turned out! Now I want all kinds of sticky rice treats. Thanks so much, Emily! Hello! I just came back hoe from an extensive trip to SE Asia, and I spent most of those days stuffing my face with crab dishes and crab rice. I have been missing it and thought of quickly doing some research on it and stumbled across this! I love what you’ve done with the space and thank you! Oh that sounds magical!! I hope you can recreate all the wonderful things you ate. Thank you for the kind words, Amrita! I resonate with you on commuting. I spent 1 hour each way when I was back in Beijing. I didn’t like the crowded subway, but that’s the time I read countless books, more than ever. On a different topic. How could you manage to work a full-time job, writing a book while raising a baby and running a food blog with stunning photography, I have no idea! And ha, it does get the better of me more often than not!!! Hence the month-long gaps here lately 😉 thank you so much for coming back and reading despite my lapses. This was dinner tonight – empty plates all round!! It would never have occurred to me to have mayonnaise with fried rice, but we all agreed it worked so well and really elevated the dish. Super simple to make as well, will definitely be returning to this one :). Only change I made was to approximately double the crab! Oh my goodness, this just made my day. Thank you so so much, Holly! I’m thrilled you liked it — and love the idea of double the crab so much that I just edited the recipe accordingly. I can only imagine how tasty that was. Thank you again for trying the recipe and reporting back!